Some people seem made for each other and as far as creating lovable indie-grunge goes Courtney Barnett and Kurt Vile seem to be utterly imperfectly-perfect. The first single from the newly founded duo ‘Over Everything’ has to be the most endearing dead-pan, story-telling, rough around the edges single out for a while. Wonderfully steady and in that unmistakable Barnett stream of conscious style, the track and it’s accompanying black-and-white video- showing Barnett and Kurt lip-syncing each other’s lines in different locations, as they sit on their amps strumming their Fender guitars amongst trees and next to abandoned highways – seems to be the perfect interpretation of the duos partnership. A calming distraction from the stresses of your day but with an enchanting air of mischief; ‘You could almost forget ’bout all the other things, like a big old ominous cloud in my periphery.’ The pairs forthcoming LP ‘Lotta Sea Lice’ set for release October 13th via Matador promises to be heartwarmingly captivating. -Who makes up Oh Pep! and what are you about? Olivia Hally and Pepita Emmerichs make up Oh Pep! We write and arrange the music together and play live with various musicians on bass and drums depending on our location. We are all about a no boundaries attitude and bringing out the unexpected to each unsuspecting pop song. -Who influences you musical or otherwise? It’s hard to pinpoint what our biggest musical influences are in terms of particular artists…the list could go on for days. But having met at classical music school with a shared love of pop, folk and country, then studying jazz and oldtime is probably a better place to start. And then there are always those good things like a swim in the ocean, riding your bike and having a chuckle! -What has the reaction been like to your EP LIving? We launched it in North America through Canadian label Star House Collective alongside our first international tour in mid 2015 and it has been received super well. It led to a lot of key media for us including ranking the CBC charts for several weeks, NPR play and a Tiny desk Concert and live performances for KEXP and KCRW. -Where was it recorded and how did you find it? Two of the songs were taken from our previous two EP’s (one from each) and remixed by Daniel Ledwell in Echo Lake, Nova Scotia. Dan produced the other two songs and this is also where we recorded them in Feb 2015. It was a great experience and really took hold of our pop elements. It was fun to spend a few days in a proper winter environment too…never seen so much snow in our lives! -Has recording an album even crossed your mind yet? If so, where would you like to go with it? It has indeed occurred to us, in fact it is already recorded and gone to press! It is being released in June. Stay tuned! -You’ve been playing at SXSW. Is this the first time you’ve played in the US and what’s your experience of it been so far? This is our third trip to the US within a year and the second we have made especially for this kind of festival. It’s always a bunch of fun playing lots of sets everyday, seeing and meeting other new bands. SXSW is by far the biggest festival we have performed at, but luckily we played in Austin last year so we were familiar with the city and how to get around. We even made sure to get back to our favourite swimming hole Barton Springs when we had a few hours off. Plus took advantage of some fantastic Mexican food and Southern BBQ. -Are you looking forward to playing ‘The Great Escape’ festival in Brighton later this year? Is it your first time performing in the UK? It will be part of our first European tour including our first time to the UK. It’s also going to be my first time to the UK, so I’m looking forward to checking it out! We have heard a lot about The Great Escape through other Australian acts so we can’t wait to be there ourselves. -Australian music is gaining particular attention at the moment with Tame Impala and Courtney Barnett to name two. What do you think of their success and do you think there is anything particular about Australian music? There does seem to be a great buzz around Australian music at the moment and rightfully so. Those guys are a stellar example of what Aussie music is about and there is such a healthy scene here that I’m sure many more acts are going to be picked up. We have a really strong original music push in Oz. -What is the Melbourne music scene like and what is the environment like for new musicians? Melbourne is my favourite music scene in the world and I feel lucky to be based here. It’s where we have honed and continue to hone our craft. It feels like almost everyone is in a band in Melbourne, which is an amazing and healthy thing. Making new music and seeing gigs is part of the culture as we know it here. It’s incredibly inspiring- the perfect environment for new musicians. -Sum up what 2016 is going to be like for Oh Pep! Exciting. Busy. Fun. We are touring Europe, North America and Australia (some of these more than once! ), launching our debut album and playing a bunch of festivals and showcases. It will be a lot of new things for us. 100% can’t wait. Many thanks to Olivia and Pepita for some insightful answers and keep an ear out for they new music they’ll be providing us soon! Oh Pep! consist of Olivia ‘Liv’ Hally and Pepita ‘Pep’ Emmerichs are one of the most dynamic pop duos from Down Under and the Melbourne group have a new single called ‘The Race’ from their upcoming EP Taken From Living which is available on August 21st. With the band citing influences ranging from Bach, Bob Dylan and Arcade Fire then you can expect an eclectic sound from them and with their new single delivers this with the pop melodies and infectious rhythms to make the song a rapid and catchy affair, yet one that musically has more than meets the eye. The track ranges from it’s electro-beat opening to it’s gently lapping guitars and percussion and those moments with metrical riffs. There musical variations are all set around clear and crisp vocals that occasionally push themselves into a light falsetto to maximise the vocal harmonies. These varying elements are backed up by snappy handclap percussion culminating in a fun and urgent track and one I’d highly recommend. Melbourne based Courtney Barnett has been knocking out extended plays and singles for a couple of years now to a very positive reception. It’s only a bit of loose, rambling indie rock, but whilst the music isn’t electrifying she usually is. She’s always on point with her vocals and witty, narrative, and observational lyrics that fit snuggly into clever song structures that make the music more fresh and engaging. 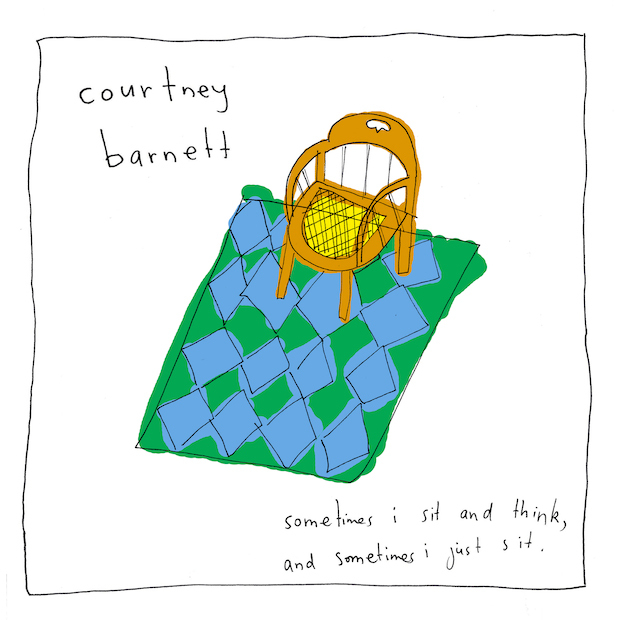 The test is whether she can deliver this with the a brand new set of songs that make up her debut LP Sometimes I Sit And Think, And Sometimes I Just Sit for which she says “follow me as a normal human with normal emotions.” Sure it’s not an oversell, but like Courtney herself, the album looks to be loudly understated. ‘Pedestrian at Best’ features that slack and grinding rhythm section and heavy percussion that has tearing lead riffs slicing their way across the track’s mainstay instrumentals. Through this is Barnett’s megaphone-like vocal that shouts out her meandering and wondering lyrics that are packed into each guitar part. It’s angsty and angry with a witty and comic tinge. Alongside that it’s catchy and engaging. She hasn’t let herself follow the indie crowd with her style, even if it’s musically nothing new. She’s forced the track to go in her direction regardless of the style she’s pursued and it makes it sound fresh and individualistic. ‘Depreston’ is the opposite of the previous single and is more gentle with it’s echoed, lapping riffs and brushed percussion. This is combined with Barnett’s closer, intimate vocals that add a greater warmth to the track as well as giving a different emotional connection with the lyrics in what is a more narrative track. It adds that most basic depth and scale to the feel of the album too which is never a bad thing. ‘Elevator Operator’ has more of a 60’s jive about it with it’s snappy percussion, handclaps and bursting organ chords that intercept them. This infectiously catchy track is strung together with a light riff with the percussion taking the lead in effect. There’s also some a clever propulsion from verse to chorus with a instant hook attached to it. Again her storytelling ability doesn’t get in the way of the appealing and easy music and in many cases the musical simplicity allows for focus upon that and opens the door for some rapid and reworked song structures. This is the key to the album ‘An Illustration of Loneliness’ offers up a different musical approach with more fuzzy, vibrating guitars and a rumbling bass line from which her lazed, wistful vocals drift in-between. These tracks are the four cornerstones of the album’s sound and there isn’t a dull moment to be found throughout the entire album for it is full of vibrancy and energy but it’s not delivered in the predictable fashion many have come to expect from upcoming artists, even in those 90’s leaning tracks in the album. A more than solid debut. Perth’s Pond are to return with their sixth studio album on January 26th in their recent announcement for Man it feels like Space Again. Following on from last year’s Hobo Rocket; current and former Tame Impala members such as Nick Allbrook, Jay Watson and Cam Avery will be looking to better their fifth studio effort which was solid and musically flamboyant, yet this did not stretch out to the whole album which was at times lacking diversity. It was in fact one of the few weak points of the album which leaves a lot of optimism for their next LP. Their new track ‘”Elvis” Flaming Star’ has a more indelible rhythmic twist in comparison to their previous year’s work, with the hand claps, snappy percussion and sharp rhythm guitar sections. These are anchored by a rapid bass line and strung out via the echoed and loose fitting vocals. The track’s structure momentarily falls through the trap draw for a spaced out interlude before launching back into the infectious rhythms. A bold and exciting track that bodes well for their January release.